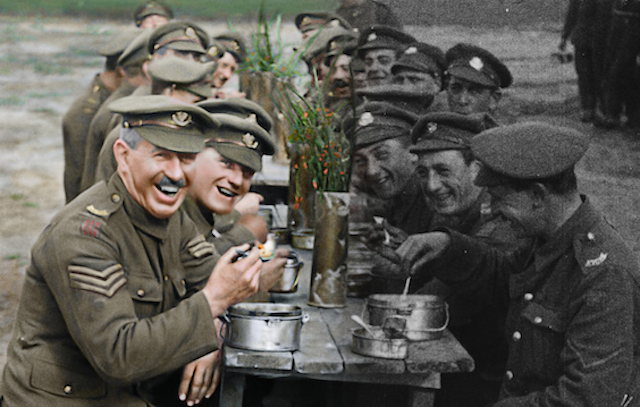 The title is taken from a poem (“For the Fallen”) written during the war by Laurence Binyon … “They shall not grow old, as we that are left grow old…” I bring that up because Peter Jackson (he of the “Lord of the Rings” trilogy) has brought these early 20th Century soldiers back to life. He took the vintage footage – in a deteriorating state and and at different film speeds – cleaned it up, put it at a normal speed, colorized it and even made it available in 3D. The results are stunning, and a breakthrough in documentary making, as now the places, events and men in the film seem available to us right now. This is not a history lesson, there are no dates or battles, but a plunge into a British soldier’s life during the Great War, fraught with the danger of battle and the specter of death with each new fight. The film’s power is that it provides a new perspective on a long gone international killing field. In 2014, director Peter Jackson was approached to create a World War I documentary by the British Imperial War Museum. This was in anticipation of the 100th anniversary of the end of the war (11/11/18), and there were no restrictions as to what the final film should be. Because Jackson was intrigued with the possibilities, and had a grandfather that fought in the Great War, he took on the assignment for free. He had access to the complete film archives that the museum possessed, but found the footage to be degraded, out of sync motion-wise and desperately unwatchable. With access to the finest digital filmmakers in the world, he came up with the idea to enhance the film and give it new life. The result was a colorized and wide screen 3D effect, stunning in its immediacy. Add in veteran memories as recorded by the BBC in the 1960s and ‘70s, and a new archive of WWI is not longer relegated to dry documentaries or more importantly, forgotten.